Yevgeny Ivanovich Zababakhin (1917–1984) was a nuclear physicist, engineer, Member of the Academy of Sciences of the USSR, General Lieutenat of the Soviet Air Force, a Hero of Socialist Labor Герой, and a recipient of the Lenin and Stalin Prizes. He was born in Moscow. He enrolled into the physical department of the Moscow State University in 1938. During the Great Patriotic War, he was called up for service in the Red Army and sent to Zhukovsky Air Force Engineering Academy. After the war, he continued studying at a postgraduate military course, where he upheld a thesis on processes in an imploding shock wave. Works on creating an atomic bomb were underway in the USSR at that time, and Zababakhin was sent to the Institute of Chemical Physics, and in spring 1948 — to KB-11 (Design Bureau 11, currently VNIIEF, the All-Russian Research Institute of Experimental Physics in Sarov). In 1949, Yevgeny Zababakhin was awarded the Stalin Prize, 2nd class, and the Order of Lenin for participating in developing the first Soviet atomic bomb and its successful test. In 1951, he was awarded the Stalin Prize, 1st class, and the Order of the Red Banner of Labor for developing and testing a bomb of an improved design. In 1953, he received a title of a Hero of Socialist Labor and the Stalin Prize, 1st class, for perfecting the physical diagram of fission charges. 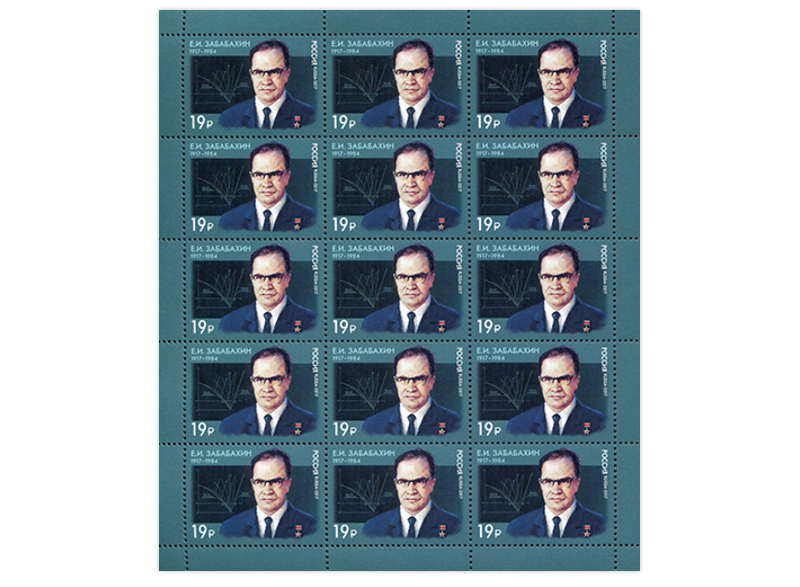 He was awarded the Lenin Prize and became a corresponding member of the Academy of Sciences of the USSR. 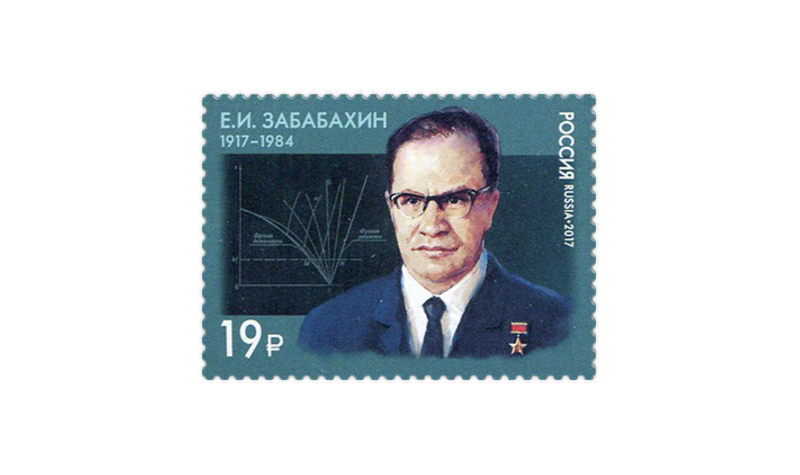 The postage stamp features a portrait of Yevgeny Zababakhin against a chart from his book Some Issues of Gas Dynamics of an Explosion.